Most all of us know the story of Joshua and the walls of Jericho, even if only from childhood recollections of the song "Joshua fought the battle of Jericho". This past Sunday's sermon was another in my pastor's current series on famous stories from the Bible: this one being about the walls of Jericho. As usual, I saw things that I had missed before. Although Pastor Voigt did not point this out, I had never before seen the "picture" of judgement coming upon the wicked inhabitants of Jericho much like the prophesies of coming judgement. Both involve trumpets. Both involve a great shout. Revelation 10:6-7 "And sware by him that liveth for ever and ever, who created heaven, and the things that therein are, and the earth, and the things that therein are, and the sea, and the things which are therein, that there should be time no longer: But in the days of the voice of the seventh angel, when he shall begin to sound, the mystery of God should be finished, as he hath declared to his servants the prophets." Obviously if you are approaching this from a pre-trib or pre-millennial point of view, then the battle of Jericho does not fit your picture unless you add the appropriate amount of time between the walls falling and judgement coming. Another point that Pastor Voigt made had to do with the wickedness of the inhabitants of Jericho. He took us back to the book of Genesis to (if I remember correctly) chapter 15:16 "But in the fourth generation they shall come hither again: for the iniquity of the Amorites is not yet full." In other words, by the time that Joshua and the children of Israel crossed the Jordan and came to Jericho, the iniquity of the Amorites was full! This brought to my mind the danger of us looking at someone else's sin and seeing them as rightly condemned without considering our own sin, and how we deserve condemnation also. It is only by the mercy of God, through the redeeming blood of Christ Jesus, that any of us will escape judgement! 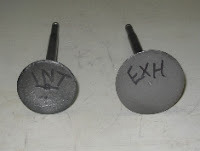 As noted in the previous post on Joe's Flathead , these was some serious discrepancy in the valve sizes. 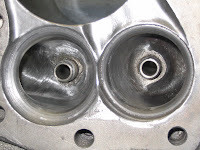 The intake valves were stock diameter (1.940") but the exhaust valves were way oversize at 2.164". After some hemming and hawing and a bunch of measuring, I decided that by putting new seats in the exhaust I could reduce the valves size there to the standard oversize Rowe valve for a UL (2.050") without sacrificing air flow. At that point it only made sense to use the same oversize valve in the intake. Normally one would like to see a larger valve in the intake than in the exhaust, but in this case I felt we were doing pretty good to just get them back to the same size. By comparing the first two pictures, one can see the 27 degree "backcut" that I added to the intake valves to enhance flow. 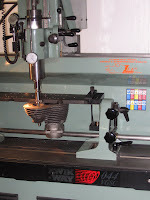 Once new valve guides were installed and sized, machining the cylinders for seat inserts was a piece of cake thanks to my Kwik-Way 044 seat and guide machine. After the exhaust seats were installed, the same machine allowed me to cut the seats with the special radius cutters in preparation for porting. If you have never seen this type of cutter, it is really pretty neat. On a standard 3 angle valve job, it cuts all three angles at once, and since the width of the 45 degree is built in, it is pretty tough to mess that part up. On the special radius cutters I have for porting work, the top angle and the 45 are normal, but from the 45 to the bowl is a specially shaped radius in place of the normal 60 degree angle. For the Flathead I used a cutter with a .060" wide seat in both the intake and exhaust for a little better heat transfer. With the seats cut, it was time to go on to the porting. In any port job, the seat area in one of, if not the most important part in getting good flow. That part of the job is made much easier and more consistent with the use of the radius cutters. The ports themselves had previously been reworked by someone, so only needed a little shaping to make them good to go. The relieve job that had been done, well, that was another ma tter. Next time we'll discuss the "relieve" part of "port and relieve" and also talk a little about valve shrouding and the heads. When you decide to hop up an antique engine you invariably wind up dealing with more complications than if you were doing similar modifications on a newer engine. Sometimes those complications are fairly easy to remedy, but sometimes budget restraints lead you to compromises. Such was the case with Joe's motor. As we opened it up we found some things that were not expected, and many of them were doubtless the result of compromises made by a previous owner. We can't fault that previous owner for these compromises , because we don't know why he may have made the decisions that he did. Parts availability at that time is just one of the things that may have been a factor. The first obvious thing we found was that the motor had oversize valves and had been ported and relieved. At first glance this appeared to be a plus, but a closer look revealed that it would have been better if the ports had been untouched. First of all, while one of the valves was a generous oversize, it was the wrong valve. The exhaust was considerably larger than the intake, and the relieving was deeper on the exhaust side than the intake. 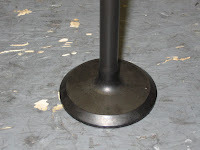 The exhaust valve being larger than the intake could be explained by a badly damaged seat at some point in time, but this doesn't account for the relieving on the exhaust side being deeper than on the intake. Such a combination would seem to suggest plans to use a turbocharger at some point in time, but that is pure speculation on my part. 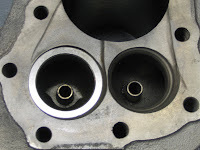 Pictured here is the stock size (1.940") intake valve on the left and the oversize (2.164") exhaust on the right. The next problem that was apparent was that the right case race had a series of 4 short welds around its outer diameter. Evidently someone had reason to believe that it would come loose without this modification. My first instinct was that if the race could be lapped to straight and round while maintaining acceptable clearances, that it would be best to leave well enough alone. After considerable "soul searching" I decided that it really needed to be addressed. One last item that I noticed right off, but really didn't get my attention as it should have, was the fact that this motor had the pre 1940 open female rod instead of the updated one that you would expect to find in a '44 model. I say that it didn't get my attention as it should have because, while I noticed that it was an "open" female rod which is prone to cracking, I did not realize that it was from a earlier year. The picture at left shows the "open" rod on the left and a later "closed" rod on the right. Over the years, every time I have had occasion to rebuild a set of open rods, I have first had them magnafluxed. Each time they have proven to have cracks in the webbing at the bottom of the rod. This set was no different . Much less apparent was the fact the female rod was narrower than a big twin rod. I assume this is due to the sides of the female rod having been ground at some point, rather than it being designed that way. 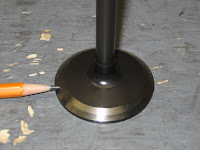 If your rods have been ground to make them narrower, it would only be to increase the end play of the rods. 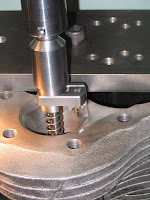 If you need to increase the end play it is usually due to one of two problems; a mis-machined crankpin (too short) or flywheel tapers that are too deep (over tightened?). Either way, it becomes a problem when building a stroker, because both the flywheels and crankpin will be replaced, giving you excess end play. In our case we would have wound up with about .090" rod end play. About now you may be saying to yourself "what a mess". And a mess it is; but the question is how do we fix it? 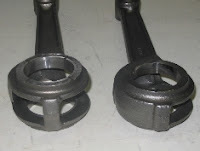 If Joe was independently wealthy, we could have simply ordered new cylinders from Flathead Power, a new set of aftermarket connecting rods and maybe even looked for a good used right case half. But here is where the inevitable compromises come in. The trick is to make the compromises needed to keep the project financially feasible without compromising the integrity of the engine. In the pages to follow, I will attempt to document how we (hopefully) accomplished this. 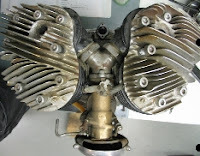 The flathead (also called a side valve) engine design has been around for man y years. Harley first used it in a single cylinder version. 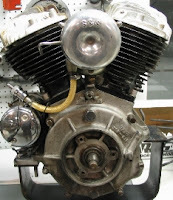 In 1929 they came out with their first flathead v-twin , a 45 cubic inch. A year later, in 1930, Harley came out with their first "big twin" flathead, a 74 cubic inch with the "V" series of model designation. 1935 was the year that the V series received its first 80 cubic inch engine. 1936 saw the last of the V series flatheads and along with it the last of the "total loss" oil systems. Yes, that's right; hard as it is to imagine in today's high tech world, early Harley's did not have a circulating oil system. Once oil had served its purpose, it ended up on the ground. This change to a circulating oil system is one of the most notable changes differentiating the new "U" series from the older "V" series. 1937 and later U models all share the same 4 9/32" stroke. Both a 74 and 80 inch engine were still offered, the difference being in the bore size. The 74 had a 3 5/16" bore while the 80 had a 3 7/16" bore. A popular hop up "back in the day" was to use these longer stroke flathead flywheels in knuckle motors in place of their 3 1/2" stroke (61") or 3 31/32" stroke (74") flywheels. 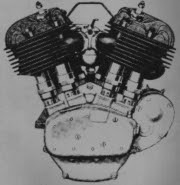 Harley continued to produce 80" flatheads until 1940, and the 74" until 1948. So how practical is it to "hop up" a Harley flathead? The answer to that question will probably be different for every owner. How far you chose to go in modifying your flathead will, to a great extent, depend a on the use it will be put to, and the amount of money you have available to do it. The mods done on a motor that is your only ride, and daily driver, will quite likely tend to be milder than if you own 3 bikes and this one is "just for fun". Flatheads have been modified to increase their performance for .... well, probably about as long as their have been flatheads. There are some mods that might be practical from a longevity standpoint which are not practical financially for many of us. Obviously if you are bothering to read this, there is probably something more than ultimate horsepower motivating you, or you would not be contemplating hopping up a flathead; you would be replacing it with something more modern. But some of us just see the beauty in making something antique run way faster than it was designed to run. Guess that's part of what makes a person a "gearhead". Which modifications you decide to do to your flathead may hinge to a big degree on the condition that it is in right now, unless money is not a issue. Stroker flywheels are not cheap, nor is the labor for installation, but unless taken to extremes are probably not a big factor in longevity at the rpm most street engines will be run. Flywheels can become unusable, usually due to damaged tapers. If such is the case with yours, then stroker flywheels become an attractive option. Increasing the duration of the cams will get more air in .... and out; increasing power. Again, unless taken to extremes, this will not decrease longevity to any great extent. Cam duration will, however, effect the rpm range at which the engine will make its power. A higher lift cam will tend to increase the power over the entire rpm range, assuming the heads flow more at the higher lift than they did at the stock cam's lift. Keep in mind however that nearly all cams that have increased lift also have increased duration. This is probably not something that should be a matter of concern for a couple of reasons. #1 Most cam grinders know what they are doing, and won't steer you wrong if you tell them what mods you have done on your engine, and what you are looking for in performance. 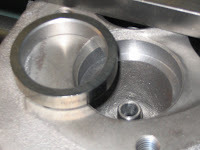 #2 If you are having your stock cams reground, the material that the cam grinder has to work with is probably not enough to create a cam that is going to be too "hot" for your motor. Having your stock cams reground to "hotter" specs could possibly even save you some money if the lobes have unacceptable wear , but the shafts are still usable. 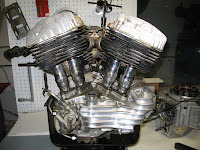 Some time ago Joe approached me about doing an engine rebuild on the 1944 big twin flathead motor that he had recently acquired. He indicated that he had been gathering parts to build it as a stroker, and wanted to know if I would be interested in doing the engine build as well as some porting work. Well, any one who knows me, will tell you that I am one of those who still believe the words "high performance" and "antique" can still be used in the same sentence together. In the following pictures and posts I am going to attempt to follow the process in pictures and words while giving some (hopefully) good technical advice. If any of you would care to offer their opinions or advice, plea se feel free to comment. These are a few "before" pictures. Wouldn't you love to have the vintage S&S carb cover? Heads are cast iron painted silver. It is at those times when we don't really understand God's sovereign plan, or the methods he chooses to accomplish his will that we as Christians are tested. It may be a situation that we do not care for, which is all part of how God is forming and molding us into the image of his dear Son. This was one of the major themes of this morning's sermon. The text was Genesis 37; the story of Joseph being sold into slavery by his own brothers. A proper understanding of God's sovereignty can help us through times of trouble. Often I think we hear the the phrase "God's plan" and consider it like plans we may make, that is, subject to changes or even cancellation. No, God's plan is more like a blueprint. One that will be followed in detail. Keeping in mind that God's way is the best way, his plan is the best plan, and that his plan WILL unfold as he has decreed should be a great comfort as we fight life's battles. Trusting God's sovereignty should not only help us to submit to those who are in authority over us, but should also comfort us greatly every day.